Abstract This month we are happy to congratulate Horace Mallet of 1, Council Houses, Mersea Road, Peldon, who will be 90 years old on 6th March - born 1884; still going strong. His father William was a sailor, but when he married, he returned to the dry land and took to thatching and other rural employment; he died at the age of 52, leaving a family of four sons and six daughters, of whom Horace and his older brother Felix (92) are still living. Most of the family went to school in Peldon, but Horace went to the Wigborough School. His first job was at Abbots Hall where he got 2/6 a week, but when he was seventeen he worked for two years on a barge, plying between the Hythe (Colchester) and London. Then he learnt his father's trade of thatching and hay cutting, and recalls that he used to have to walk from Great Wigborough to Mersea every day to the straw. Later, when he got a job in Polstead, Suffolk, he used to ride to work on a bicycle. Good old days those were! It seems working on the Thames Barges which plied their trade along this coast ran in the Mallett family with two of Horace's brothers spending their lives working as crew and skipper. A third, James, was a sailor who returned to work on the land once he had a family. The heyday of Thames Sailing barges working as commercial vessels was between 1870 and 1920, peaking at around 1914 and then going into decline. It is estimated there were around 2,000 in 1900. The barges were often used to transport, straw and hay to London bringing back loads of manure to spread on the land; they also carried grain, bricks, and cement, coal, stone, timber, gravel, sand, sugar, and machinery. The majority of the Thames sailing barges were built in Essex and Kent, their flat bottoms allowing them to sail in the shallow waters of the east coast and to sit on the beach or the mud for loading and unloading. The Skipper and sometimes the Mate would live aft in the cabin while the fo'c'sle served as a store and as accommodation for others of the crew. The crew might vary from a boy or a man to perhaps 2 - 4 men in a large seagoing barge. One of Horace Mallett's older brothers, Joseph Charles William Mallett, was born in 1872 in Peldon. His gravestone in St Mary's Churchyard tells us he died in 1911 at the age of 39 and he was 'Skipper Of the CANVEY'. He started work as an agricultural labourer in Great Wigborough but by the 1901 census he was Mate on board a barge called HADLEIGH CASTLE with skipper James Anderson. Between the 1901 census and Joseph's death he must have taken over CANVEY as skipper. It is known that Moses Spitty was the skipper of CANVEY in the 1901 census and he died in 1903 - did Joseph take over as skipper then? CANVEY's register was closed in 1939 when she became a house barge. CANVEY was a partially rigged house barge in Hedgecocks yard, Maldon, during the WW2 and was put on Cooks' blocks in 1945 or 46 and her bows burst open. She was patched up and taken back to Hedgecocks yard where she was partially broken up. Tom Hedgecock told me that he sat on her mainmast head to saw through the topmast and after a fair bit of sawing realised that the rope round his waist in case he fell was tied to the topmast he was sawing through. At the end of their working lives many boats were dumped on the mud to rot, most of them having been stripped of useable materials. Some were used as house barges and eventually rotted away although a small number have been restored and are sailing again. The 'Graveyard' referred to is off Promenade Park in Maldon where it is estimated 15 hulks were dumped. Another of Horace's brothers mentioned in the Parish News was Felix Mallett born on 19th September 1881 a well-known Colchester bargeman who lived to over 100. He was also born in Peldon and married Esther Webber in 1905. From the book Barges by John Leather we learn Felix had worked since he was 10 years old on farms at Wigborough where he earned 3 shillings a week. Aged nearly 16 in June 1897 he first went to sea as a third hand in the Colchester owned sailing barge, UNIQUE. Moving from agricultural work his wages more than tripled to ten shillings a week. The freights were linseed, wheat, barley and stacks of hay. The hay was loaded at Hythe Quay, Colchester, and shipped to wharves at Vauxhall as horse feed, often called 'stackwork'. By the time 1899 Felix was offered the job of Mate in the Colchester-owned barge, EUREKA he had been involved in a lot of 'stackwork'. Barges used in this trade were called 'Stackies'. They were involved in supplying fodder, hay and straw for the hundreds of thousands of horses that worked in the London streets, bringing back a hold full of dung to be spread on the East Anglian fields. A typical load would be 40 loads of hay, 10 foot high, 25 foot wide with 2 or 3 feet overhanging the sides of the barge. Often the hold would be filled with root crops and usually the crew would do the loading of hay, building an inwardly sloping stack. Once under way, one man would sit on top of the stack and call out directions to the member of crew steering below. Felix then went on to serve as a hand on the steam barge EAGRE which between 1900 and 1914 worked a regular return service from Colchester to London. From Black Eagle wharf on the Thames she used to take cargoes of Truman's beer, groceries, machinery, large timber and other goods destined for Colchester. At that time, Parry's fleet included KING, QUEEN, SIRDAR, VERA, VICTOR and MILLIE. 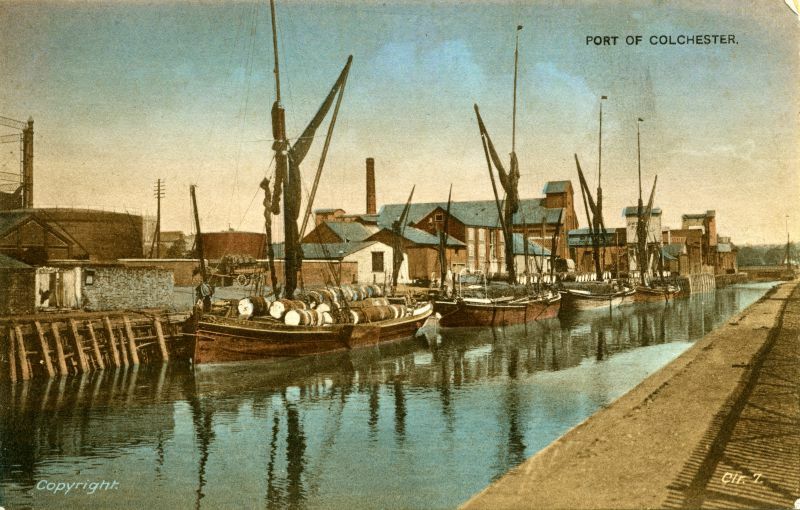 Owen Parry's oil mills at the Hythe were using imported cotton seed or groundnuts for their products in place of English-grown linseed or rapeseed. The company needed a fleet of sailing barges to transport raw materials and products from and to the port of London. Much of the manufactured oil was shipped to London to be used in varnish. The Hythe, Colchester. Owen Parry's Mill is up towards Hythe Bridge. The first barge is Parry's VERA with a deck cargo of barrels. They were used to send out linseed oil and more can be seen further down the wharf. Colchester Hythe was the home port of Felix Mallett and many other bargemen. In the 1911 census aged 29 Felix is recorded as the Master of the sailing barge, GRETA, moored in the East Dock at St Katherine's dock. His Mate was John French from Colchester. During World War 1 all barges were required to anchor at night so their position was known to patrol vessels at darkness. Felix continued throughout the war working on GRETA and was awarded campaign medals as a merchant seaman. At the end of the war coastal sailing barge trade diminished and GRETA was sold by Owen Parry to the London and Rochester Barge Company who had a large fleet of sailing barges. Felix stayed as skipper of GRETA until 1926 when he returned to Owen Parry's as skipper of VICTOR. He sailed in many sailing barge races and yet, as John Leather writes his pride of achievement was reserved for the barge as a working craft. In the 1939 register, a survey taken of the population as the country went into war, Felix is listed as Master of VICTOR moored at the West India Dock Poplar E14. Despite the dangers of being loaded with high explosives the bargemen preferred the relative quiet of the Medway to going into the London docks however VICTOR had a narrow escape during a daylight raid on Chatham when a bomb fell between her and a lighter loaded with depth charges, which fortunately did not explode. The blast unshipped the Victor's cabin stove, disturbed her hatch covers and shrapnel damaged her mainsail. John Leather remembers Felix at the wheel of his barge as a shortish stocky man, in blue Guernsey, jacket and oilskins and sea boots, a cloth cap jammed down on his head against the gusts of wind. VICTOR was released from war service in 1946 and taken to Brightlingsea hard for repairs. 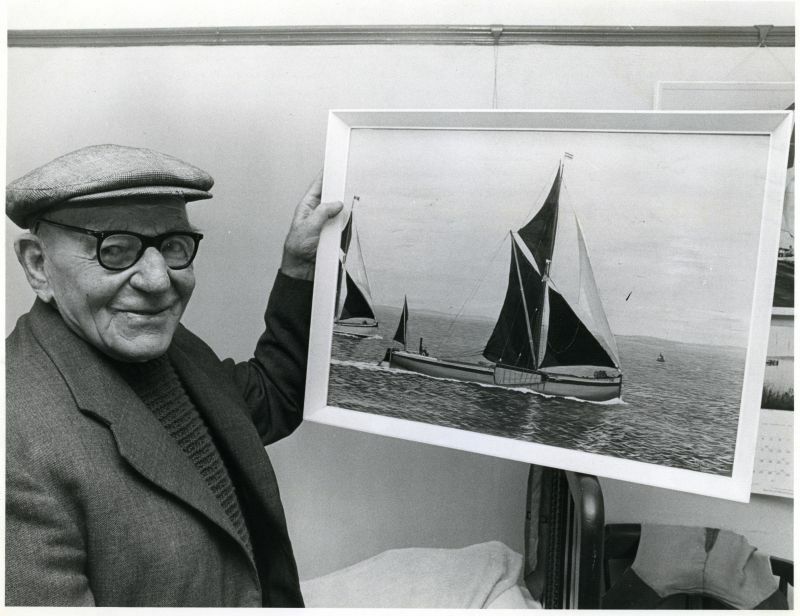 Felix was asked to skipper the sailing barge, ALAN, lying on the Medway but at 64 years old having survived two world wars and 48 years afloat he decided to retire at Christmas 1946. Living in Colchester he never lost his interest in the sailing barges and took great interest in their resurgence as pleasure craft. Both GRETA and VICTOR are now pleasure craft, running trips throughout the summer and autumn from Whitstable and Ipswich respectively. A whole chapter in the book Barges by John Leather is devoted to Felix who was clearly a great storyteller with a good memory. He died in March 1982 at 100 years old in Marylands, Shrub End Road. He typified the best type of sailing barge skipper; consummate seamen in their own surroundings, conscientious for their craft and owners, ably managing their part of the barge's business and accounts. They were unassuming seafarers who have left the coast the poorer for their passing. Leslie Mallett was Horace's son (and Felix's nephew) and as soon as he left school he started working for Peldon Village Stores, or Dansies as it was often referred to. He worked in the shop all his life until retirement. A strong Methodist he was involved with the Methodist Chapel on Lower Road playing the organ and when the chapel was closed playing for St Mary's, Peldon. He lived with his Dad, in one of the Council Houses until Horace's death at the age of 93 in 1977. Leslie was a kind man and much loved in the village. His kindness clearly made an impression on the children, still remembered today! Leslie died on 20th May 2005. His obituary in the Parish News shows just how well-loved he was. Leslie died in hospital on 20th May, aged 92 years. He was a true Peldonian, being born in the old council houses in Mersea Road where he lived until about 20 years ago when he moved to one of the Senior Citizens Bungalows in the Glebe. Leslie worked in Peldon Village Shop where he began when he left school, until he retired. Leslie never married but was a real gentleman and was very gifted. He loved to play the organ at the old Methodist Chapel in Lower Road until it eventually closed. It was pulled down by a Mr Field and rebuilt into a house known at Chapelfield. Leslie was a good artist and went to the Peldon Art Group where he produced some lovely paintings until his health failed. 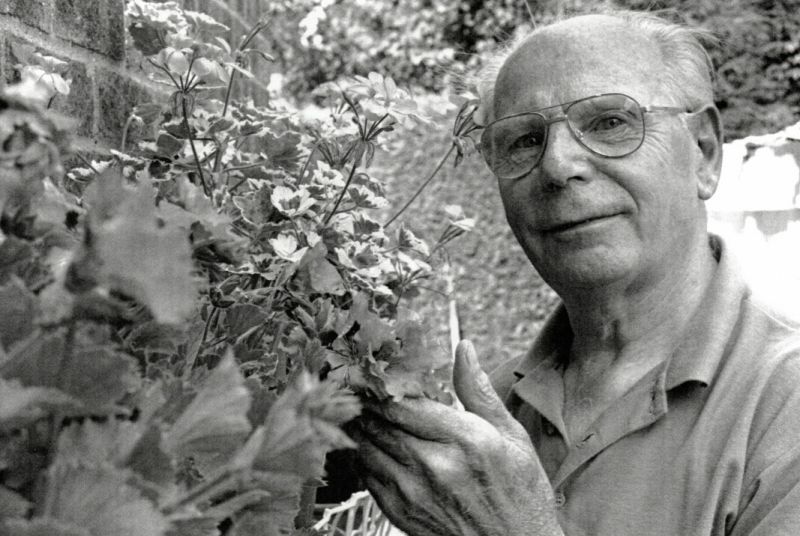 He was also a great gardener and grew his own vegetables, as well as having a lovely flower garden. Leslie joined St Mary's Church from the time the Methodist Chapel closed and assisted with the organ, playing over a number of years. He also delivered the church magazine in the Glebe, and joined in the village lunches where he enjoyed the food as well as the company until more recently when his health failed.